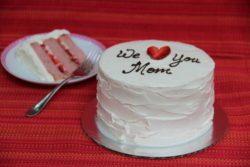 When all you need is a simple and delicious cake, a homestyle cake will meet your needs at any budget. Choose any flavor and refer to the chart below to pick your size. We can write a message on top, but no color or designs are included. Rainbow sprinkles can be coated around the sides for an additional $5. Please order at least 1 week in advance.